You have a nice start there, but I think you need more attention on perspective and painting. Did a quick edit, hope it helps for study purposes. Fixed most of the perspective errors, worked on a more dynamic pose and improved volume & painting overall. There's still several things to improve but they're minimal for now. 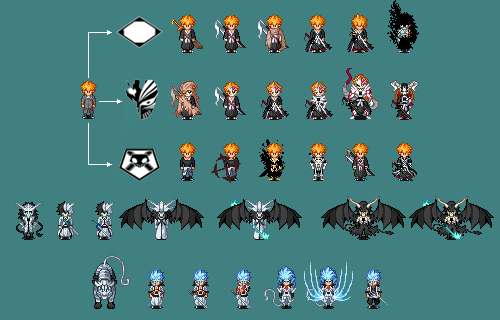 Awesome sprites! I saw a lot of your flat outfits, I like those skins for DBLOTS very much. Is that Brolly one of your first izometric outfit? I never saw you drawing izometric, but it is cool! I'm not a spriter, but as a average person would say that Leshrot fixes are "controversial". Perspectiv and pose fixed are ok, new chest is awesome, but cloths seems to be too dark on the sides and too bright inside. For me it don't look like clothes from fabric/cotton, but more like some plastic/rubber material. PS. I respect the work of you both very much. Royalz - good luck with improvement! Thank you for your time spent doing that. It actually looks better proportion and perspective-wise, however, i still don't like the way you shade, so i'm going to stick with my "style". I do, however, like the way you did his chest and arms' lightning, that will help a lot. Thanks again! when he enters the dragon ball legend? It actually looks better proportion and perspective-wise, however, i still don't like the way you shade, so i'm going to stick with my "style". Sorry, but what you're doing isn't a style, nor shading. 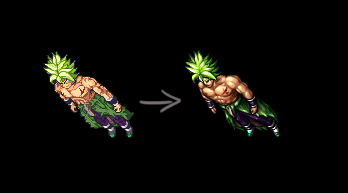 For example: I took this broly sprite (right) from the internet as an example. Your current "style" (left) consist on base color placement, scratches and a few dithering, we can't call that shading because it's flat. A good enough shading works like on the right image. Also using "style" as an excuse won't get you anywhere. You need to learn the fundamentals before creating your own style. That's actually the exact opposite, lmfao. Leshrot's Broly is way more cartoonish than Royalz's. Royalz's Broly looks like he resized it at least two times larger than it's drawing size. When I first saw it I actually thought there was some dirt on my screen, before realizing what I was actually looking at. Okay, Mr. "Supreme Spriter", i'm gonna stop you right there, because everything you say is so wrong on SO many levels. First of all, a "style" you do isnt a style, nor a shading as well, it's not even a pixel art, because a program does everything for you, so actually you have no rights to criticize me for either of those things. Secondly, the way i do isometric for now may consist on base color placement and other things you've mentioned, but that's how you actually learn and polish your ways of doing pixel art. That's how it all works without any Photoshop brushes, you have to learn to do it yourself and every idiot can use Photoshop to do 80% of the job for him. Lastly, i'm not using style as my excuse and actually sticking to it and polishing it, as i mentioned before, WILL get me even further than you can ever be. That's all from me, im grateful for your tips, but i will be even more if you don't post here no more with that attitude. That's how pixelart works, mate. And it's funny you added that outfit, let's see which one is more blurry. 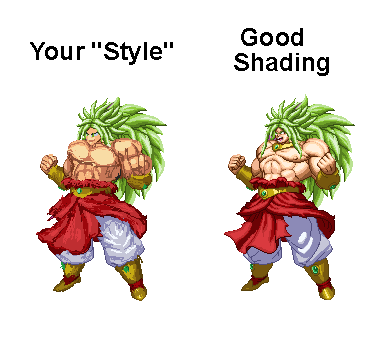 the Broly have problems with the AA, shade, proportions and anatomy in general that need to be fixed and all of us know Leshrot only fixed a few problems and made it more attractive, but with his own style. the point we should focus is you have to analyze all the tips and improve the outfit with your own style and paint! Never said it was, I do sprites. Base color placement is okay. Scratch and put pixels randomly for dithering and cheer to it work right isn't. You also should try PS then. The criticizes are not about style, are about fundamentals. There's a lot variations of styles, but let's say these are the "4 main". 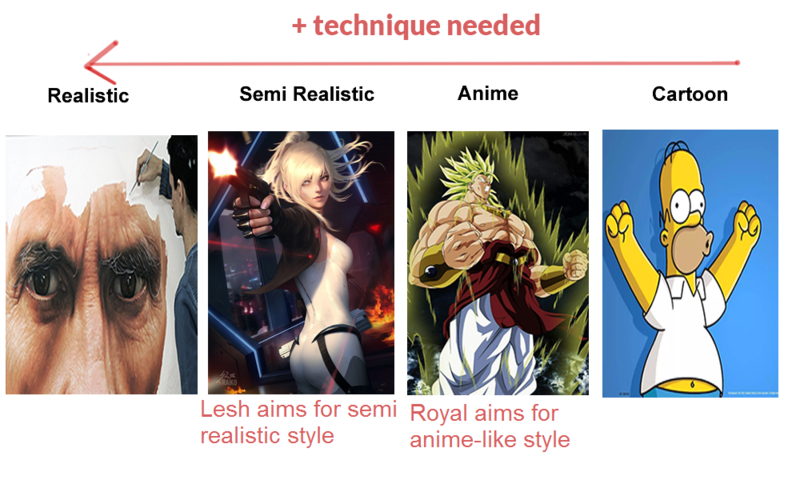 You need more knowledge/skills to do a realistic portrait than do a simpson character. I guess that's clear for you. In sprites we kinda have that divison too. My criticizes AREN'T towards style, it's about fundamentals, learn it so more and better you'll be able to do. 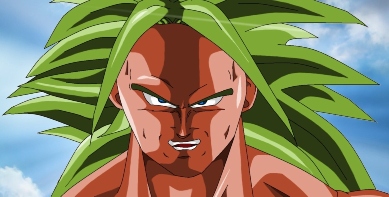 Check Darqfelenor's Broly, it's a clear try to be "anime style" but it have a lot of errors of on design and painting, not on style, but technique. I hope you understand and stop taking it personally. I can understand that maybe you're doing sprites for some years and is hard to accept you may have kept doing mistakes like this.